For two days, the BlueChilli office in Sydney was in a state of excitement, nerves and activity as we hosted the #StocklandStartups for their first immersion session. The immersion was the first time the startups had been back to BlueChilli since being selected for the Accelerator at the end of November of 2018. However, these motivated founders were not relaxing and were definitely not in holiday-mode during the past six weeks. Instead, the founders had meetings with BlueChilli Product Managers, Entrepreneurs-in-Residence, and advisors while continuing working on the customer validation they started during Bootcamp. The founders also were working their way through an extensive resource list of books, articles and podcasts curated by BlueChilli’s expert team of startup builders. The founders were doing this, of course, while getting their lives in order and ready to commit to living and breathing their startups in the lead-up to their graduation showcase in July. In each of our programs, founders meet on a monthly basis for immersion sessions. 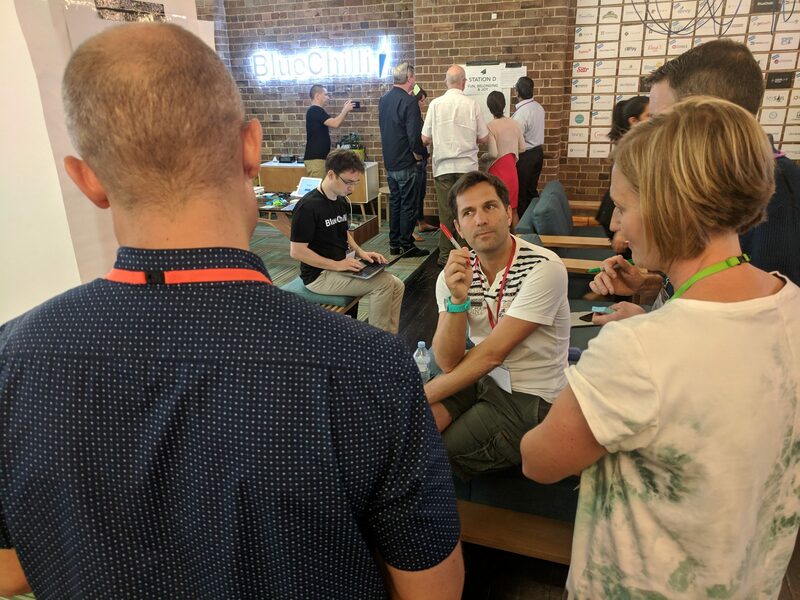 BlueChilli is excited to expand our immersion locations with the Stockland Accelerator, with monthly immersion sessions coming up in Sydney, Melbourne and Brisbane. Some of the Stockland Accelerator founders brainstorming their Team Charter during the first immersion in Sydney. Founders also attend weekly online masterclasses with industry experts, network with their fellow founders and take deep dives into topics they will confront during their startup journey. These lessons include startup methodology, product management, growth and investment, overcoming leadership challenges and building sustainable businesses. The first immersion session focused on welcoming the startups into the BlueChilli founder family, introducing them to the BlueChilli way of working and their team. Our aim is to set up the founders on the path to success as they build startups that will change the property industry. In addition to masterclasses and immersions, the founders are challenged to constantly work with their Product Managers and Entrepreneurs-in-Residence as they focus on regular product management and design sprints, development issues and to build out their customer base. What did the kick-off immersion involve? One of the major highlights from the first immersion session of the Stockland Accelerator was the quality time and one-to-one meetings the founders had with Stockland executives representing Stockland’s different business units. Robyn Elliott, Stockland’s Chief Innovation, Marketing and Technology Officer, opened the immersion days by challenging the founders to imagine a different future for the property industry – and to show Stockland what they can do differently. The cohort started working together as a cohesive team by drafting a team charter and creating a collaborative and supportive environment for working together. This powerful session was led by Head of People and expert in organisational design, Claudia Barriga-Larriviere. Superstar Product Manager, Alejandro Patterson reminded the founders of the importance of utilising and revisiting the Lean Canvas on a regular basis. Head Entrepreneurs-in-Residence, Brett Geoghegan reviewed best practices for working with advisors and mentors, sharing tips for dealing with advisor whiplash and the information overload that will inevitably come from various advisors depending on their background, experience and points of view. 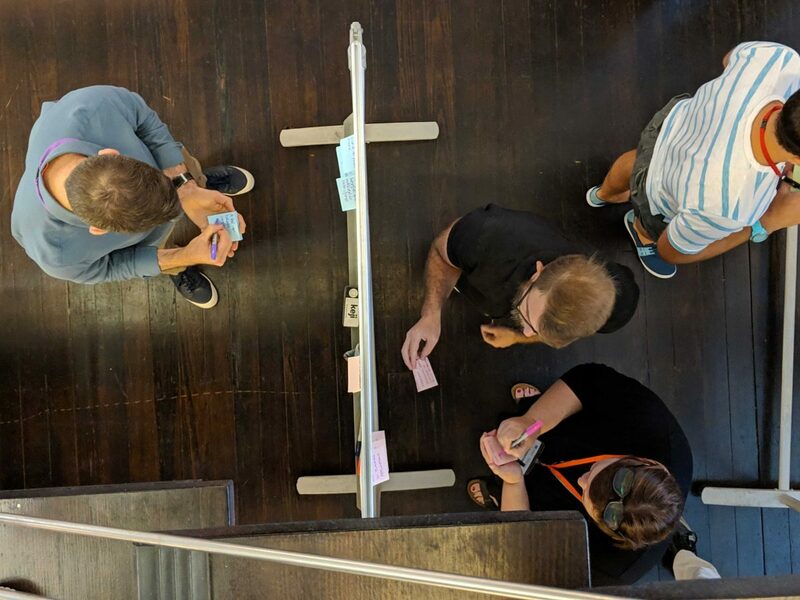 Senior Product Manager, Cheryl Gledhill helped founders work through Risky Assumption Mapping and how founders should approach validating a problem, create a solution and implement a strategy to monetise the solution. Head of Product Design Bianca Chrysostomou andProduct Designer Alex Zanoni led exercises on user research and the importance of understanding behaviours, needs and motivations in order to create or validate opportunities. Head of Communications, Matthew Overington emphasised the importance of clarity of communication by challenging the founders to craft six- and 30-word pitches to help founders articulate their offer and think from a customer or investor perspective. Founders from the Stockland Accelerator brainstorming Risky Assumptions during the first immersion. Over the two-day immersion sessions, the founders received a very solid startup education, but we also made sure to have fun. Founders spent an evening with the BlueChilli team and external advisors, playing trivia and learning about their fellow founders’ hidden sources of knowledge. The founders also met with BlueChilli’s alumni during a breakfast panel, during which we discussed insights to get the most out of BlueChilli’s accelerator programs and incredible network of founders, staff members and corporate partners. Many thanks to Dr Carla Harris from Longevity, Josh DeNutte from Spark, and Laura Simmons from Theratrak for sharing their insights with us. How can #StocklandStartups make the most of being in a cohort or team? + @laura1simmons: lean into the camaraderie of going through something together. I was both humbled and impressed by the founders during the immersion and all that they were able to achieve between the end of bootcamp and the first day of the immersion. The founders have all shown a great appetite for learning, as well as a hunger for success. BlueChilli and Stockland are looking forward to supporting them throughout the program to help their startups grow into successful companies that will have lasting impacts on the property industry. To learn more about the #StocklandStartups, see the announcement that introduces all startups and founders that we are delighted to work with during the Stockland Accelerator. We enjoyed hosting our Stockland founders and partners. We’ve learned a lot, and are looking forward to helping nurture their businesses into the future. Program Director, Matthew Werner is an entrepreneur who successfully founded an education management business based in Paris and the United States focusing on leadership development, corporate innovation and entrepreneurship. Matthew is supporting startup founders to help them build the best proptech startups and drive change and innovation across the property industry.